Having a dirty car is not something to be lived with anymore. With the advent of car washing equipment, businesses have found that having a drive-through or drive-in car wash is a great way to keep their customers happy and to increase their profits. Being able to simply drive into a car wash bay and allow the machine to do the work is something that causes the customers to keep coming back time and time again, which could make you a lucrative profit. The ceiling and wall booms car washing equipment that are available will allow your customers to sit in their car while the machine gets their car nice and clean. These booms move to completely wash the car from hood to bumper. These booms are available in many different sizes and styles to allow you to match it to your particular building that you are using for your car wash. These booms and systems include a way to discharge detergent and a rinsing cycle to give your customers a clean and shiny car with very little effort on their part. A clean car is not complete without an air vacuum system. The air system booms can include either a vacuum to clean up the inside of the car or an air system to dry the car after it is washed. This can give your customers the tools that they need to clean their car from the inside to the outside. These air system booms can be mounted on the floor, on the ceiling, or on the wall to allow your customers to use them easily and simply. Your customers will be delighted with the ease in which they can dry or clean out the inside of their car with your car washing equipment. Whether you choose to purchase just the pieces that you need for your existing self car wash bays to update them or you purchase a complete car wash bay package, you will find that each piece that is available is constructed of high quality materials to last for years of efficient use. The self-lubricated ball bearings, insulated high pressure hoses, polished stainless steel, and more will keep your car wash working efficiently for a long time. The car washing equipment are available in a wide range of sizes, from small to large, to fit your needs and your location. With single, double, and triple boom options, you can customize a car wash system that will fit the desires and needs of your business. From washing cars to washing trucks to washing buses, you can find the size and style of car wash that you need for your purpose. Car wash equipment can give you a business that is easy to take care of and simple for your customers to use. Choosing the pieces for your intended purpose will give your business the added boost that it needs to gain added loyalty from your customers and added profits for you. 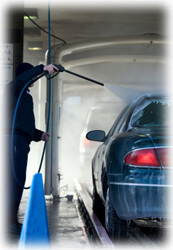 From small to large, you can find a car wash system that will work for you and your business.